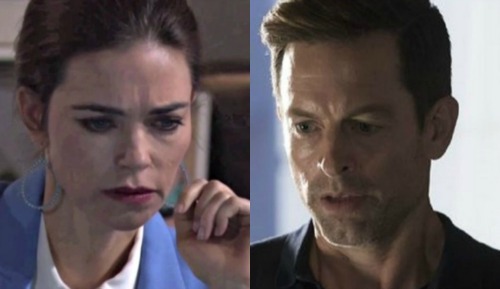 The Young and the Restless Spoilers: Adam Newman Back for Revenge – Victor’s Missing Son Behind Company Threat? The Young and the Restless (Y&R) spoilers tease that Victor (Eric Braeden) will face major bombshells over the next few weeks. His latest shocker will lead to many more, so let’s consider what the great Victor Newman’s dealing with. In Wednesday’s episode, Victoria (Amelia Heinle) fills her father in on a stunning threat. Someone’s out to get Newman Enterprises, so the situation is dire. The person behind this Newman destruction plot has access to confidential files. Just about anybody could achieve that with a good hacker. This doesn’t necessarily have to be somebody on the inside or even someone living in Genoa City. However, it does have to be somebody with a grudge against Victor. If this were about Victoria, there’d be other ways to take her down. For example, some deep investigating might reveal her involvement in the cover-up crew. The truth about J.T. (Thad Luckinbill) is a bigger secret than anything found in a Newman file. That’s for sure! With that in mind, this scheme is likely all about Victor. Who could be targeting Victor and why? Nick (Joshua Morrow) is a possible contender, but let’s consider a more surprising option. There’s been a lot of talk about Adam (last played by Justin Hartley) lately, so this would be the perfect comeback story. Could this be how Y&R will introduce an Adam recast or perhaps Michael Muhney’s return to the role? Many Young and the Restless fans would welcome any version of Adam. He’s an intriguing character and he could really shake up the Newman clan right now. This wouldn’t be the first time Adam’s targeted Newman Enterprises. Y&R viewers will remember that Adam worked with Ian (Ray Wise) on the Paragon Project. It unleashed a serious virus and caused plenty of chaos. Adam might be trying another plot on his own. If Adam survived the explosion and had to fight his way back to health, he could resent Victor. His grudge has time to build, so Adam may hold nothing back in his revenge mission. He could be determined to truly crush Vic and destroy his legacy. Do you think Adam Newman’s behind the threat? Would that be a fun twist for fans? The Young and the Restless spoilers say some exciting scenes are coming up, so stay tuned. We’ll give you updates as other Y&R news emerges. Stick with the CBS soap and don’t forget to check CDL often for the latest Young and the Restless spoilers, updates, and news.